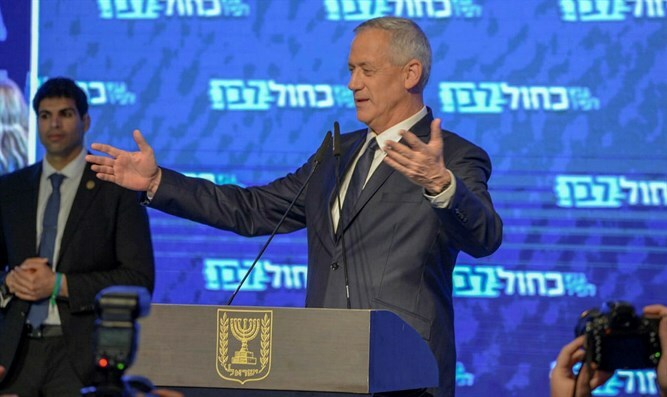 Despite the Likud leading with 97% of the vote counted, Blue and White chief Benny Gantz celebrates 'historic achievement'. Blue and White party chairman and former IDF chief of staff Benny Gantz expressed satisfaction Wednesday morning with the outcome of Tuesday’s election, and optimism that despite initial results showing a victory for the right-wing bloc, his center-left faction would ultimately prevail in the final count and be tasked with forming the next government. “Good morning friends, and yes, it is a good morning!” Gantz wrote to supporters on social media. Gantz went on to call the Blue and White’s projected 35 mandates a “historic achievement”. With 97% of the vote counted, Netanyahu’s Likud party leads Blue and White by some 14,000 votes, with 26.27% of the vote, to Blue and White’s 25.94%. Both parties are currently projected to win 35 seats, though the Likud is favored to reach the 61 seats necessary to form a government. The right-wing – religious bloc is currently projected to win 65 seats, compared to 55 seats for the left-wing – Arab bloc.